• A loose tooth: When you’re a kid, a loose tooth means an exciting trip from the tooth fairy. When you’re an adult, it’s considerably less fun. It could mean a tooth injury, nerve or jaw damage, a localized infection, or any other number of problems. Regardless, you should check with your dentist, because it’s better to be safe than sorry. • A severe toothache: If you have a minor toothache, there are a handful of home remedies that could help you. But if you have a severe toothache or one that refuses to go away, you should see your dentist. It could be one of some issues, and even if it doesn’t require a major procedure, it could mean you need to change your oral healthcare routine. • Bleeding and aching gums: Seeing your gums bleed after you floss can happen to those who don’t floss regularly enough. But if you experience excessive bleeding in your gums — or your gums are left in pain — you may be experiencing common signs of gum disease. And for that, you would need a professional. • A swollen jaw: If you have a swollen jaw and are experiencing a fever, trouble breathing or swallowing, and have a bad taste in your mouth, you should contact your dentist immediately. These could be the signs of a salivary gland infection. 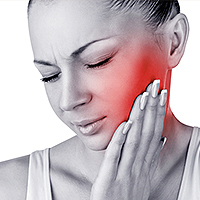 • Dental Abscess: An abscessed tooth is a painful infection, typically found at the root of your tooth, so any signs of a dental abscess should have you on your way to the dentist for an emergency appointment. • A numb tooth: If you’ve had a painful toothache and now feel nothing at all, it could be a sign of an infection spreading to the root of your tooth. Dental emergencies tend to happen at the worst possible times and in the worst possible places, so being a patient of a dental practice like Mid Wilshire Dentistry — which is readily prepared to deal with such emergencies — is crucial towards taking care of those emergencies as quickly and effectively as possible.